Peanut allergies are the third most common food allergy for American children and the second most common food allergy for adults. About 1.4% percent of children and 0.6% of adults are allergic to peanuts. No one knows why, but peanut allergies are becoming more common among children. Boys have higher rates of peanut allergy than girls, and non-Hispanic African-American children have a higher rate of peanut allergy than children of other ethnicities. Unlike some of the other common childhood food allergies, peanut allergies are often life-long. Studies show that about 20% of children under age two with who are allergic to peanuts will outgrow their allergy by adolescence, which means 80% will have the allergy for life. Most of the deaths related to food allergy are associated with peanut ingestion and anaphylaxis. Peanuts are frequently found in our food supply, and are sometimes hidden in both in food and non-food items, and that makes them a real challenge to avoid. Symptoms associated with a peanut allergy tend to show up immediately after eating peanuts or food containing peanut products. Symptoms may begin within a few minutes, but may take as long as two hours to appear. Skin reactions such as rash, hives or eczema. Gastrointestinal symptoms like nausea, stomach pain, vomiting, or diarrhea. Airway symptoms including wheezing, coughing, or a runny nose. Swelling, also known as angioedema, of the lips, tongue, or face. Severe reactions, called anaphylaxis, may occur, affecting multiple organ systems. Peanuts are more likely to cause anaphylaxis than other major allergens. Anaphylaxis is a medical emergency and requires prompt treatment. Peanut allergy is diagnosed by a doctor who specializes in allergies—an allergist. To diagnose you, your doctor will take a detailed medical history, will perform a physical examination, and likely will order food allergy testing. The treatment for peanut allergy is the elimination of peanut and peanut products from the diet. There are multiple research studies going on right now to look at immunotherapy for peanut allergy, searching for a cure or treatment for peanut allergies. Most involve a process of desensitization to peanuts through eating microscopic amounts of peanut protein. Because of the risk of severe allergic reaction, none of these treatments are ready for your local doctor's office yet, and they're certainly not something you should ever consider attempting on your own. Unfortunately, the only safe treatment right now for peanut allergy is to avoid peanuts. As mentioned, you have to eliminate all peanuts from your diet to avoid an allergic reaction. Equally important, you must avoid all foods that are at risk for cross-contamination with peanuts in the manufacturing process, such as granola bars, cookies, crackers and cereals. The Food Allergy Labeling and Consumer Protection Act (FALCPA) insists manufacturers list peanut as a potential allergen ingredient for the consumer. Not only will you find this information in the ingredients list, but it will also be on the package. Some products won’t call out peanut-based ingredients on the label. There are two things you can do in this situation: call the manufacturer and inquire about the specific ingredients contained in the product, and/or skip eating the product. Because of cross-contamination risk (this happens when foods are made in the same facility and trace amounts of peanut can contaminate tree nut containing products), many families will avoid eating tree nuts when there is a peanut allergy. Highly refined peanut oil is probably safe for most people with peanut allergies, but cold-pressed oil may contain higher levels of peanut proteins. Be careful when using highly refined oils, and be certain of the oil type and source before consuming. Peanut oil is commonly used in deep-frying and Asian cooking. Peanuts are nearly ubiquitous in Thai, Chinese, and Indonesian cooking. They are also common in West African and Southern American cuisine. Peanut oil (labeled as arachis oil) may be found in cosmetics, medications, creams and topical products. 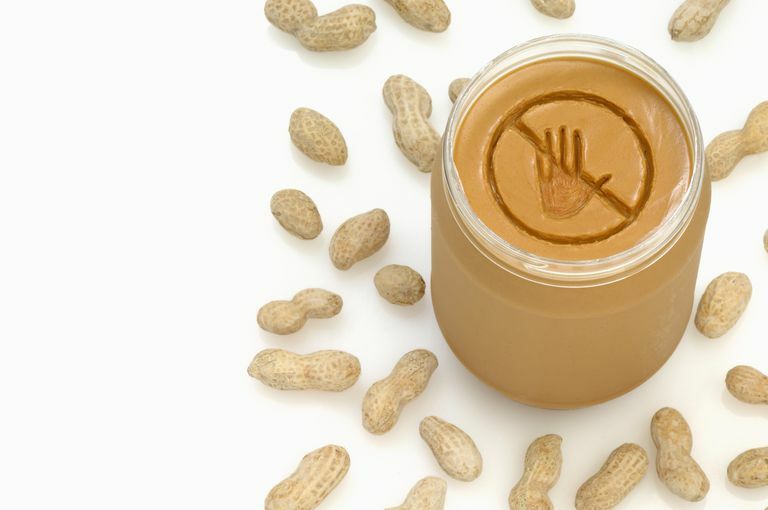 Heating peanuts or peanut butter may release proteins into the air that can cause a reaction for people who are sensitive to air-born allergens. Many allergy-friendly manufacturers will state that their products are made in peanut-free facilities, so you can feel confident choosing products from those companies. Even though peanuts are a legume, not a nut, about one-third of children with a peanut allergy will also be allergic to at least one type of tree nut, most commonly almonds and hazelnuts. A small percentage of children with peanut allergy may have an allergy to multiple legumes, most commonly soy, chickpeas, and lentils. Only five percent of those with a peanut allergy are allergic to legumes (beans)—in other words, 95% of people with peanut allergy tolerate beans. There’s a 20% risk of allergy to lupine (also known as lupin), a type of bean used in high protein, gluten-free and specialty food products. Lupine is common in European cooking and baking, and is becoming increasingly available in the United States. If you have a peanut allergy, you shouldn’t avoid potential cross-reactive foods out of fear of developing an allergy to them, because doing so will limit your diet, and may actually contribute to developing sensitivity to them rather than prevent problems. If you're worried about cross-reactivity, talk to your doctor about which foods are safe for you to consume. Kids love peanut butter, and a peanut butter and jelly sandwich is a lunchbox staple. But peanut oil is sticky: it can cross-contaminate other foods and remain behind on lunch tables, hands, or drinking fountains. Schools have dealt with the risk of cross-contamination in different ways that include establishing separate lunch tables for allergic kids and banning peanuts from the entire school. Cleaning peanut residue off hands and desks is relatively simple, but it does require a daily cleaning routine. What appears to be most challenging is balancing the needs of children with peanut allergies with the freedom of other children to eat their favorite foods. Keeping the lines of communication open with the teachers and staff is the best approach to safeguarding children with peanut allergy. If your child has a peanut allergy, contact the school before the first day. Talk to the school nurse and teacher about a plan to keep your child safe at school. And have your peanut-free alternatives to the peanut butter and jelly sandwich at the ready. Because peanut butter sticks around, there have been people who have had reactions after kissing another person who has eaten peanuts. There is no way to wash the peanut protein out of one's mouth. Teenagers or adults who are dating should talk to their partners about their food allergy before kissing. Many airlines now give out little packages of pretzels (or no snacks at all) instead of the classic airline peanuts. However, some airlines still hand out peanuts. Before you fly, research the allergy policies of the airline you intend to fly on. Some are more receptive to people with peanuts than others. Call ahead to book certain peanut-free flights or request a peanut-free meal. There is still no cure for a peanut allergy, so managing it involves strict avoidance of all peanut products and being prepared for possible reactions. If you have been diagnosed with a peanut allergy, your doctor will prescribe an epinephrine auto-injector (commonly called an Epi-Pen) that you will need to carry with you at all times. Guidelines for the Diagnosis and Management of Food Allergy in the United States: Report of the NIAID-Sponsored Expert Panel. Do You Need to Avoid Soy and Peas With a Peanut Allergy? Is Banning Peanuts From Schools for Allergies the Right Way to Go? I Have a Bad Peanut Allergy. Can I React Just from Smelling Peanuts? My Child's School Is Peanut-Free, So What Can I Send for Snacks?